Cut the salmon into dice. Mix with the olive oil, salt and smoked paprika. Feed the salmon pieces onto skewers. Finley dice the red chilli. Finely slice the spring onion and zest the lemon. Finely dice the garlic and chop the leaves of the basil and the coriander. Mix these ingredients in a bowl with the chilli, ground cumin, olive oil and lemon zest and juice . Season with salt. For the cous cous: Place the cous cous in a bowl with the salt, pepper, olive oil and saffron threads. Mix with a fork. Bring the water to the boil and pour on top of the cous cous. Cover the bowl with cling film and allow to cook for 10 minutes. 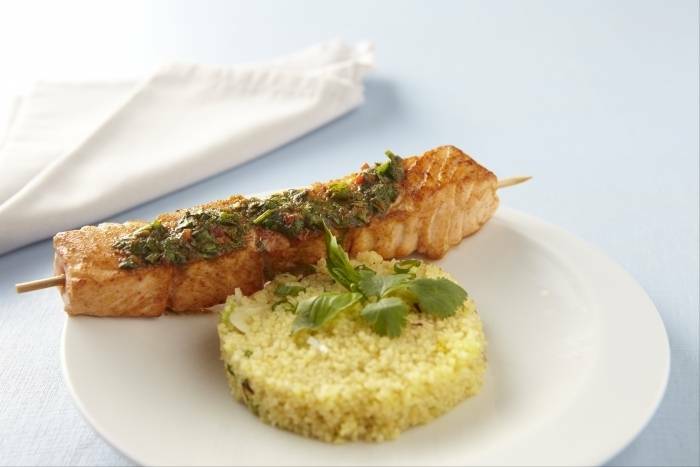 When cooked, break the cous cous up with a fork and make sure you have no lumps. Add the spring onion and check the seasoning. Heat a frying pan until hot and cook the salmon brochettes for a minute on each side. The salmon should be pink in the middle. Cook for longer if necessary. To serve: Fill a stainless steel ring with cous cous. Place the brochettes on top and finish the plate with a drizzle of the salsa.